100% satisfaction guaranteed. Get the freedom to focus on your business rather than your IT. There’s no IT problem too big or too small that we can’t, or won’t, handle. We go above and beyond because your success matters. Are you confident your data is protected? Check out what we offer and give us a call. We’re not your typical IT company. We care about your business and your success. That’s why we take the time to learn your business and offer first-rate managed IT services and support. Save time and money with worry-free, affordable managed IT services and support. Put CIO Tech to the test. Get tips on how to minimize vulnerabilities and maintain a healthy IT infrastructure. I’ve been using CIOTech since 2011 for my current employer as well as for multiple consulting engagements. In short, CIO Tech actually cares about providing the best service. With CIO Tech you get what you pay for and a whole lot more. CIO Tech will be your partner and you’ll be glad you called them. We are the real deal. That’s because we partner with world-renowned Fortune 500 technology innovators to provide the best Managed IT Services & Support available. Find out how our partnership with top network & security platforms in the information technology industry can help you. Minimize the risk of theft, fraud and DDoS attacks. 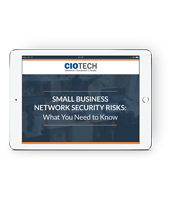 Identify potential network risks and vulnerabilities with our Network Vulnerability Assessment. We love how our customers feel about us!